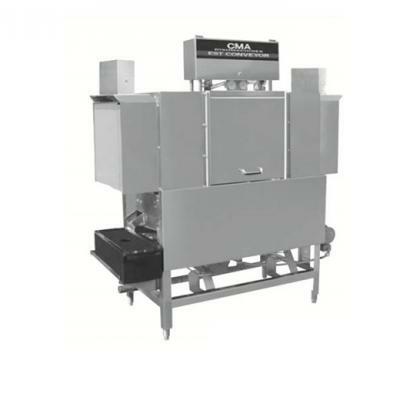 CMA EST 44 - Alco-Chem, Inc.
​ Automatic water control system. 243 racks / 970 covers per hour. Economical to operate. Uses only .49 gallons of water per rack of dishes. Single control switch activation. Power rinse heater system. Unique 3-stage (EST44) washing process provides wash, power rinse and final n Automatic soil purging system filters wash water and traps plate debris into an external tray. Tray can be easily removed for cleaning. All stainless steel construction offers durable performance and years of trouble-free operation. Large 19" opening accommodates larger items and utensils. Auto start/stop makes operation more energy efficient. Easy to remove and replace curtains for cleaning.